Occupational Therapy — OT4KIDS INC.
Laura began her career serving pediatric and adult populations in a hospital setting, where she worked in outpatient, inpatient, and acute care. Laura admits pediatric OT is her first love, and she is thrilled to be working with kids full-time. Her philosophy is to work and PLAY hard to learn and grow together to help everyone reach their full potential! Mike has been with OT4KIDS for over 15 years. He has a diverse working background in acute, inpatient, outpatient, home health, and pediatric settings. Always smiling, "Mr. Mike" has a peaceful manner of handling the most chaotic of situations. He is a master of setting up a therapeutic environment, skillfully meeting client needs to support "teachable moments". This allows clients to achieve the optimal state of alertness for building new skills and attaining their full potential. When Quinten isn’t working with his clients at OT4KIDS, he’s working with youth programs at his church — coaching a church league basketball team and volunteering for children’s ministries and mission trips. 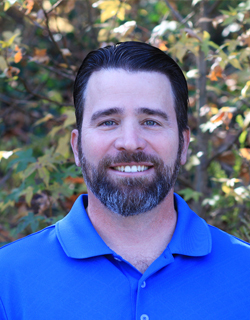 Dale has a calm, skillful approach to therapy that focuses on building rapport and trust with his clients. He is always having fun with therapy sessions, and his kids are, too! Brooke’s previous experience includes working in North Carolina Pre-School settings as a lead teacher, and working in Early Intervention in home, clinic and school settings as a Service Coordinator in Arizona. Brooke has always had a passion for working with children as she is, by far, the oldest of 6 siblings. She is very much enjoying her new professional home here at OT4Kids and is looking forward to continuing to grow personally and professionally with this awesome team! In her free time Brooke enjoys watching sports and all things outdoors. Ashley has done volunteer work with Hinds Feet Farm, Wings of Eagles Ranch, and Learning Charms Handwriting Camp. Her strengths include sensory integration techniques and behavioral strategies. Ashley's dream has always been to work with children and feels very fulfilled working with OT4KIDS! Patty's diverse background includes experience in music, baking, and the arts -- a much appreciated addition to the creativity and artistic skills of our therapy team. With a creative background in visual arts, Meredith wanted to merge her love for art and children after volunteering with Arts For Life -- an organization that brings art programs to young patients in hospitals. This led Meredith to occupational therapy, where she believes in building trust with her clients to help them reach their potential! She provides a client and family-centered approach to treatment to best meet her client's needs and maximize each child's independence. Katie is always giving and contributing to the needs of others both in her personal and professional life. She believes in serving others in a compassionate, caring, and creative way. This philosophy guides her practice as she successfully connects with client needs to foster success. The children at Amos Cottage Therapeutic Day program are helped by Katie's mild and patient demeanor during weekly therapy sessions, where she excels at redirecting negative behaviors and encouraging children to have the utmost regard and esteem for themselves and others. Meagan is a recent graduate who comes to OT4KIDS from Pasadena, Maryland. Her love and passion for kids stems from growing up with three younger sisters, one of whom considers herself a "proud Aspie". When Meagan is not working to help children maximize their confidence and independence, she enjoys being outdoors and playing with her rescue pup, Rondo. Prior to becoming a COTA, Miranda worked in various settings as a certified nursing assistant where her love for helping individuals reach their full potential grew stronger. This passion carries into her work with children and families here at OT4KIDS. Miranda’s unique ability to connect with each child on a personal level and guide them in reaching their full potential makes her a great addition to the team! Amy has an extensive background in customer service, along with experience as a Certified Nursing Assistant in inpatient acute/critical care, pediatrics and skilled nursing facilities. With her educational background in sociology and psychology, Amy has always had a desire to work with individuals with special needs and determined that occupational therapy was a great fit. She believes in treating the client in a holistic manner, with compassion and empathy for both the client and their family. Amy first became interested in occupational therapy while helping care for her grandfather after a stroke left him wheelchair bound and partially paralyzed. After college, she worked in the public school system as a teacher's assistant with special needs children, where she realized her true desire to help children reach their full potential. Since then, Amy has been working in pediatric occupational therapy for 12+ years in the home setting with OT4KIDS. Kari brings a wide variety of knowledge from her previous experience as a school-based therapist. Her love and passion for kids allows her to recognize each child's individual abilities and connect at their level. Kari takes a holistic approach to help children meet their goals and gain maximum independence. Amanda has previously enjoyed working with children as a program leader at a child development center and counselor for children with Autism through the Autism Society of North Carolina (ASNC) at Camp Royall. She loves helping children to reach their full potential by harnessing their individual strengths and passions in order to make therapy fun and meaningful for all involved. Dallus has previously worked with children of all ages at the YMCA, and in her free time she currently works with children teaching gymnastics. Amber believes that every child deserves a chance to succeed, and this is evident in her calm and encouraging demeanor with her clients! Jared’s experience in hospital, outpatient, and international settings has qualified him to connect uniquely with kids and families. His deep love of the outdoors and helping one another motivates him to always give his best. Jared lives by the motto “Love one another” as a guide to his life and professional practice. Chelsea worked as a Paraprofessional worker with a client with profound disabilities before going back to school to study occupational therapy. She has experience working with pediatrics in both the clinical and school settings, giving her a unique perspective to work with kids and families. Christine began her occupational therapy career working with adults in an inpatient setting. She has shifted her career path to follow her passion, working in pediatrics, helping children be the best they can be. She provides services in our Graham clinic as well as in-home in the Greensboro area. When she is not working Christine enjoys spending time outside and exploring new places. Sarah has a background working with children with severe disabilities in their home setting, which led in her desire to become a pediatric occupational therapist. She has a passion in helping children gain confidence in their abilities and strives to provide each child with an individualized and unique experience tailored to their needs. Nysepia enjoys helping people and has gained experience through working in an outpatient pediatric clinic. She has had the opportunity to see the joy and outcomes of connecting with children and their families through bridging everyday skills and playing. She is looking forward to expanding her experiences with OT4KIDS. She loves to dance, travel, and spend time with family and friends. Jessica began her career working for the school system which furthered her love and passion for working with kids. Her creativity allows her to meet the kids at their level while providing an engaging, creative and fun environment. When Jessica is not working, she enjoys painting, being outside with her dog and traveling. Cayce decided her heart was in pediatrics after a year of volunteer work at an outpatient pediatric OT clinic. Her outgoing personality and creativity allows her to connect with children and help maximize their independence. She looks forward to expanding her passion and interest of occupational therapy in the pediatric setting! Cayce provides services in our Graham clinic as well as in-home in Graham, Greensboro and Winston Salem.